I thought that the MANY Twi-haters here would be thrilled to know that The Twilight Saga: Breaking Dawn Part 2 has been listed as one of the worst movies of 2012. One of the worst. The film landed a horrible 11 Golden Raspberry Awards nominations earlier this week, leading all other movies in the annual roundup of the year’s worst films. I guess not even the love of Twi-hards couldn’t save this flick from the wrath of the Razzies. Yeah, 11 Razzie nominations. Pretty damn bad. Breaking Dawn Part 2 dominated the nominations this year, it even beat out Adam Sandler’s That’s My Boy (which got 8 noms). Razzies will be handed out February 23, the day before this year’s Academy Awards. 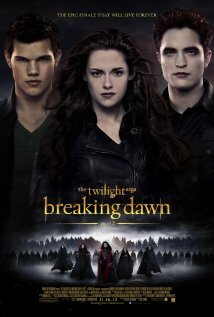 What do you think about Breaking Dawn Part 2 being nominated for so many Razzies? Was is as bad as they are making it out to be? I haven’t seen Breaking Dawn 1 or 2, so I can’t say how I feel about the nominations (although, I HATED the book, so I don’t imagine the movies are better). Share your thoughts below on Breaking Dawn Part 2’s Raspberry Award nominations.